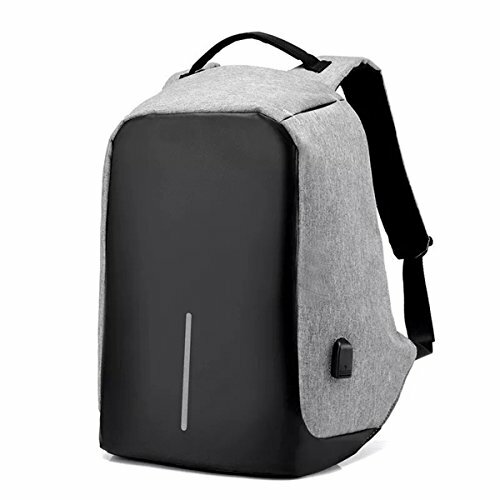 Key Features - Grey Color Laptop Backpack For Men And Women For Stylish Office Use As Well As For Trendy College Students. Huge Compartment Size That Can Fit Upto A 14.6 Inch Laptop With Ease. Multiple Pockets For Other Accessories. Charging On The Go - With Our Attached Charging Dock, Now Charging On The Go With Your Portable Charger Is Now Easier Than Ever Before. Usb Cable In The Main Compartment Of This Bag And You Can Connect Your Power Bank To It, Really Convenient. No Theft Will Easily Open Your Backpack. It'S Super Good For Travel, Work Or School. It Also Has The Pocket For Your Card In The Front Of Both Straps. Concealed Zippers Lie Next To Your Back, Which Makes You Far Away From Theft And Protects Your Wallet, Laptop, Phone And Precious Things. Comfortable Dayback: Padded Back And Adjustable Padded Shoulder Straps Make It Comfortable To Wear Great Choice To Be Used As Travel Backpacks And School Backpacks., Multipurpose Backpack: It Can Be Used For Daily Work, Leisure, Travel. It Can Hold Your Umbrellas, Glasses, Wallets, Keys, Mobile Phones, Mobile Power And Other Daily Necessities, This Bag Can Keep All Items Clean.